In this day and age, many Muslims eagerly await the end of Ramadaan and the coming of Eid-ul-Fitr to gain their ‘freedom’ in order to go back to committing sin and disobeying Almighty Allah [May ALLAH Forbid]. Many people start on the day of Eid itself and engage in shameful and reprehensible behaviour in the name of celebration. We should remember that celebration does not mean committing sin, but rather it involves remembering Allah Ta’ala and being grateful to Allah Ta’ala for showering His Mercy and Bounties upon us. Let us look at the true essence and significance of Eid-ul-Fitr, and the way in which those pious servants close to Almighty Allah celebrated Eid. 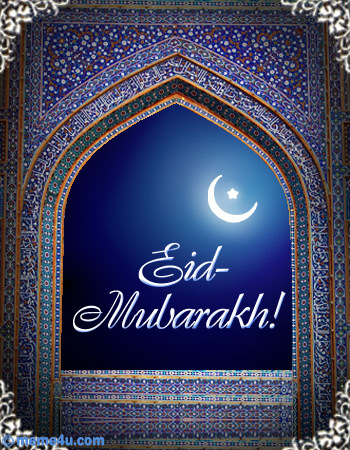 Eid is a day of celebration for Muslims, a day of happiness. On this day, Muslims perform two rakaats of prayer, meet one another, shake hands and embrace and give charity to the poor and needy. Islam teaches protecting the poor, helping the helpless, and easing the pain and sufferings of orphans and the meek at every turn, and they should not be forgotten, especially on the day of Eid. That is why Rasoolullah (Sallallahu Alaihi Wasallam) ordered us to pay the Sadqa-e-Fitr before performing the Eid Salaah so that Muslims remember their poor brothers on this occasion and include them in their happiness. 1. To greet, embrace and shake hands with one another, after the Eidain prayer is an act of reward; and which is also a means of increasing love and affection between Muslims and a way of expressing ones joy and happiness. I received an email in which someone tried to prove that the numeral ‘786’ does not refer to Bismillahir raHmanir raHeem and it is an innovation by ignorant people. Moreover he copied the 7-8-6 Numerals of Sanskrit Language then flipped/arranged them in a way that makes the symbol for Hari Krishna and said that it also spells out Hare Krishna. Well, there are hundreds of scripts and languages in this world, take any sentence or numeric’s, write it in NON-TRADITIONAL styles, FLIP horizontally or vertically, ARRANGE it as you want and produce any rubbish as the people did. Don’t they have anything better to do with their time than mess around with stupid letters and flip them whatever? Ask then to Go and do some proper research in Quran and Hadith rather than wasting their little brain’s cells on imaginary letters. People use 786 to represent Bismillah as a short or to prevent disrespect when writing letters and posting. ‘786’ is indeed the numerical value of “Bismillahir Rahmanir Raheem”, what difference does it makes if it coincides with the numerical value of the name “Hare Karishna”? A Muslim writes 786 with the intention of “Bismillah…”. It is mentioned in the first Hadith of Sahih al-Bukhari that for everyone it is their intention that matters. A person who performs Salah for the pleasure of Allah he is rewarded duly and the one who performs Salah to be noticed by people is not rewarded. In the period of our beloved Prophet Peace and Blessings of Allah be Upon Him, numerology (the knowledge of interpretation of words according to numbers) was present, as evident from the following incident. Panch Naare Punjatan Ke Ek Naara Haidari ” YA ALI ” karamALLAHu wajahul karim ! To meet somebody with gaiety and cheerfulness is the first act of a good deed. It is also an act of prayer to ponder over the work of nature. To have suspicion in one’s belief is equivalent to polytheism. Improper modesty is the course of misfortune. Very few people are convincing company. Showing appreciation is the reason for receiving Divine blessings, and ungratefulness is the reason for receiving difficulties or hardship. Respect is from amongst the excellent of marvels and charity is from amongst the most excellent forms of worship. Death is an uninvited companion. In every second are hidden difficulties. To be victorious over your worship is an excellent feat. An intelligent person lowers himself to attain a high status while a foolish person raises his status thereby disgracing himself. Intelligence falls into 2 categories: Natural disposition and adaptation.There is no benefit from accommodated intelligence without the intelligence of natural disposition: for example sunlight is useless to one who cannot see. Friendship is a relationship proficient from birth. To be ashamed of ones sins augment ones eyes, to be proud of ones good deeds destroys ones eyes. The companion that destroys worship, his desires and extensive worship for one day is the enemy of the soul. An intelligent person always remains sad and remorseful. In idleness one is reminded of gallantry. To combine charity with obligation is wickedness. To speak ill of an open sinner is not backbiting. A persons true worth is hidden under his tongue. To forgive is the best form of revenge. A wise person is he who due to his previous experiences goes about doing things a different way. Even though there is fear in speaking the truth, yet in it is salvation. Though it is simple to lie yet in it is definitely destruction. Restlessness combined with patience is definitely more inconvenient. A poor person is he who has no friends. Knowledge with practise is liberating and practise without sincerity is useless. Poverty, whom many people feel ashamed of, is better than that wealth which leads to sins and wrong doings making a person face dishonour and disgrace. There is never a shortage of experiences and an intelligent person is he who progresses by it. To fear difficulties is a strange condition of adversities. To forgive easily is supreme respectability and to be vengeful is extreme meanness. The recognition of a respectable person is when anyone is generous then he too treats that person with generosity and if anyone is meek towards him then he too becomes docile, and a wicked person is that person, when approached with submission then he treats that person with generosity and if he is approached with generosity the he becomes negligent. The reason the Ulama are poor and helpless is, because the ignorant are plenty who do not understand their value. For a criminal to plead guilty is the best form of amnesty or intercession.